The Salinger Stakes, also known as the Linlithgow Stakes, is a Group 2 race run on the Saturday prior to the Melbourne Cup at Flemington Racecourse on Victoria Derby Day. VRC Derby Day is the first of four meetings making up the Melbourne Cup Carnival held at the tail-end of the wider Melbourne Spring Racing Carnival in late October or early November each year, and features four Group 1 features. The highlights on the bumper race card are the Group 1 Victoria Derby (2500m), Group 1 Kenendy Mile (1600m), Group 1 Coolmore Stud Stakes (1200m) and Group 1 Myer Classic (1600m). There are also two Group 2 support acts on the program with the Wakeful Stakes (2000m) for fillies and the Salinger Stakes run over 1200m by sprinters. Open to horses aged three-years-old and over, the Salinger Stakes is an open handicap event offering $300,000 in total prize money. It can serve as a lead-up to the following Saturday’s Group 1 Darley Classic (1200m) over the same track and distance, a double last achieved by Dance Hero (2006), while in 2015 Delectation improved on a lead-up fourth in the Salinger Stakes to win the Darley Classic a week later. The latest edition of the Salinger Stakes runs on Saturday November 3, 2018. The official Salinger Stakes 2018 Results & Finishing Order will be available below once the sprint takes place at Flemington on Saturday November 3, 2018. 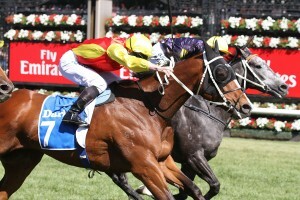 Salinger Stakes odds are led by horses with a good 1200m record and those proven down the Flemington straight. Some gallopers are more suited to turning track like Moonee Valley, so Salinger Stakes betting favours those that have previous experience at Flemington Racecourse and those also proven in similar Group company over the season. Upsets are not uncommon in the race and recent winners to salute at double figures in the Salinger Stakes betting markets include Éclair Choice ($18 in 2015) and Illustrious Lad ($12 in 2016). Other recent upsets include the back-to-back victories of Fontelina ($17 in 2012 and $11 in 2013). The latest Salinger Stakes 2018 betting markets and links to the Victoria Derby Day odds online will be provided below so stay tuned for the best markets on the hopeful sprinters down the Flemington straight this Melbourne Cup Carnival. Top Salinger Stakes tips include backing horses coming off a last start win over a similar distance, getting behind graduates of a race like the Caulfield Sprint and backing runners proven down the testing Flemington straight. Favourites only have a mediocre recent strike rate in the race so another good Salinger Stakes betting tip is to look at the horses with good lead-up form at $10 or over in the markets. Our Ladbrokes’ insider Salinger Stakes 2018 betting tips and Flemington sprint racing selections will be provided below the week of the race so stay tuned for the horses to back and sack this VRC Derby Day. The Salinger Stakes field features a quality line-up of sprinters, although the top tier short-distance runners are often saved for the following Saturday’s Group 1 Darley Classic (1200m). Runners in the Salinger Stakes field may come off lead-up spring runs in a race like the Group 2 Caulfield Sprint (1000m) on Caulfield Cup Day, which last produced a Salinger Stakes winner with Éclair Choice (2015) who completed the double. Delectation (4th in 2015) improved on his Salinger Stakes results to win the Group 1 Darley Classic next-up that spring. Photo Credit: Ultimate Racing Photos. Horses may also come off a Sydney run in something like the Group 2 Premier Stakes (1200m) run at the start of the month at Royal Randwick. Another Sydney lead-up into the Salinger Stakes field is the Listed Tattersall’s Club Lightning (1100m), a race Deep Field won on way to his Salinger success in 2014. The next year’s Tattersall’s Club Lightning winner Dothraki (2015) went on to run third in the Salinger. Salinger Stakes nominations close the Monday before the race runs that Saturday on Derby Day and the final acceptances and barriers are out on the Wednesday. The official Salinger Stakes 2018 Final Field & Barriers are due for release on the Wednesday of race week and will be detailed in full below so stay tuned to see what sprinters make the starting line-up. The early Salinger Stakes 2018 Nominations close the Monday leading-up to Victoria Derby Day, the full list of nominated horses to be published below as soon as released. The Salinger Stakes form guide gives punters crucial information needed to place a well-informed wager like the track / distance records of the runners, their jockeys / trainers and lead-up performance. The form has held up in tougher Group races later in the spring a number of times in recent years including in the Darley Classic run seven days later. In 2013 Fontelina won the Salinger for the second year on the trot before a fourth to Buffering in the Darley Classic. Spirit Of Boom also ran second in both the 2012 and 2013 edition. In 2012 Spirit Of Boom (2nd) went on to run third in the Group 1 Winterbottom Stakes (1200m) in Perth two runs later and fourth in the same Ascot elite level on the back of his 2013 Salinger Stakes second placing. In 2015 the Salinger Stakes produced that year’s Daley Classic winner Delectation (4th). The 2018 Salinger Stakes Form Guide link will be available here once the field is released. The Salinger Stakes results over the past decade have been a mixed bag between favourites and double-figure winners scoring an upset. The last favourite to salute was Rich Charm (2017), while the last back-to-back champ was Fontelina (2012-2013). Other notable recent Salinger Stakes winners include Eagle Falls (2009), Hot Danish (2008), Dance Hero (2006) and Takeover Target (2004).